My Autography of my life. 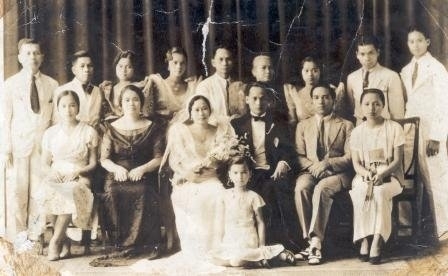 1930 I work as sewer in the tailor shop of Carias Biglang-awa, I sew Barong Tagalog, Kaki pants, camisachitno, he pay me 70 centavos one wigan or stapo kaki pants, people from Ipo + Lamesa Dam are our customers, we had lots of orders, so Carias hire Ca Asing, me, Mameng, Toneng, Quita + Orang to sew at his shop. I told him I gave all my allotment, no spending living with my parents, he was so happy + thankful. 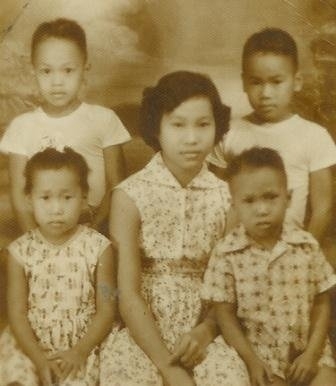 1938 April 12, I gave birth to a beautiful son Jr. Ramil, 7 pds 12 ounces. We lived in that house, we repair, put store under, I sell sari sari store, then my parents move with us. 1948 We lived in Navy housing in Hawaii for two years, where Lindo born July 2, 1948. 1940 Miss Carinio a registered nurse rent of our room in the house. Then 1941 – my husband stationed US.S. 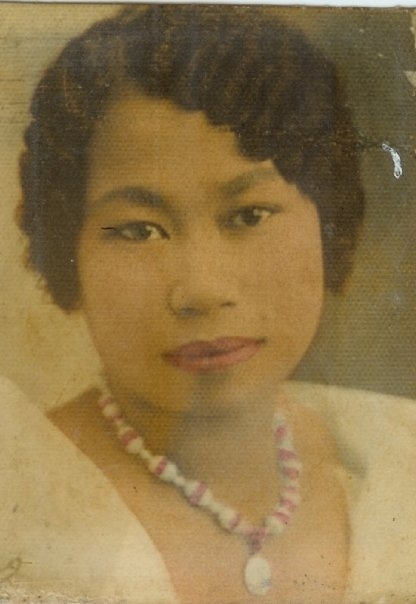 Chester 1941 – I was three months pregnant of Norma my husband – I gave birth to Norma July 10, 1942 – left since then War – 2 – broke up + we don’t hear from him, all our furniture was taken from our house, we hide in the cave of Mang Indo’s sheter in the mountain, my father, Mother, me + Jr. Acang Tayong, Eddie + P.I. 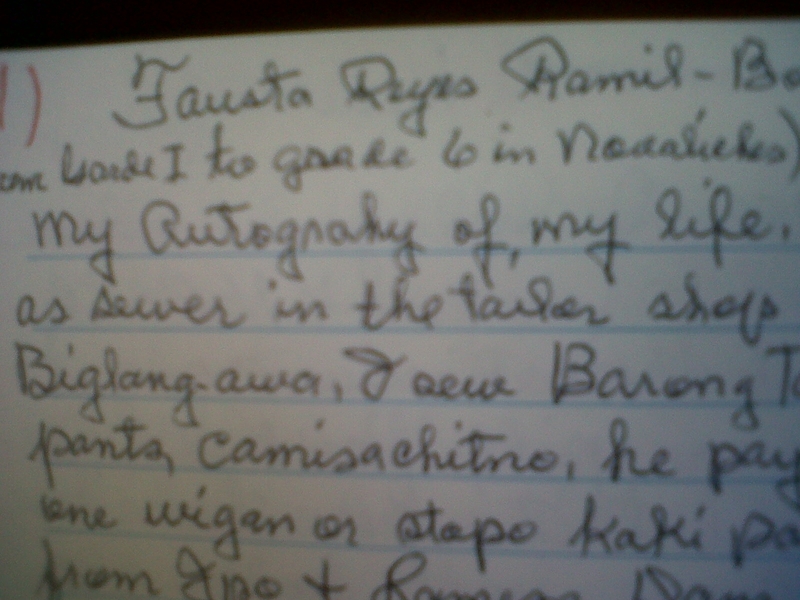 live together with Otong, Simang + Ruben, my father catches fish – dalag at the river + plant camotorey kahay for our food in 1941-1942-1943-1944 Then 1945 my husband come home. Norma was three years old when her Dad come home, she don’t know him. Miss Carinio was my Nurse when I give birth to Norma. 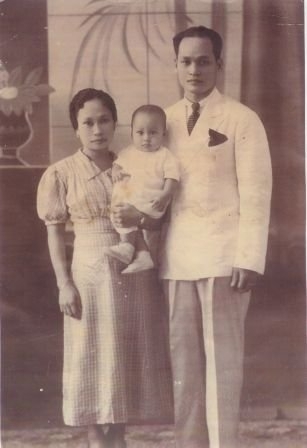 Grandma and Grandpa with Baby Jr.
Then 1946 I gave birth to Mario June 21, 1946 We lived in our house in Novaliches, my husband still in the service, every three months he abroad USS. Chester, home port in Manila. Then 1947 my husband stationed in Hawaii me, Jr., Norma + Mario lived there in Navy housing where I gave birth to Al July 2. 1948 – Tripple Hospital Hawaii – 1949 my husband retired from the Navy of 20 years service, so 1950 we went to Philippines for good, we had poultry supply for sale, we had poultry, piggery, fish pond telapia) and several joke boxes, every store in Novaliches Plaza we had jokeboxes, Jr. is collecting the money every weedends. They go to school Jr. Manila Central University. Norma Far Eastern University the board Halili transit back + forth, Novaliches to Manila. 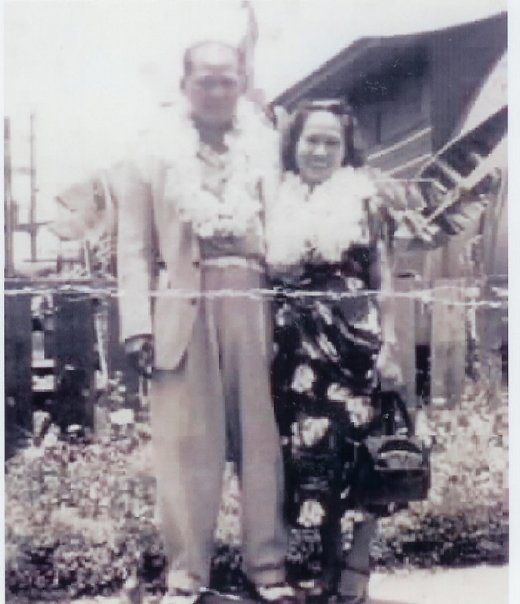 Grandma and Grandpa in front of their house in Hawaii. Manila to San Francisco, Compadre Tamayo (Jo’s Ninong) pick us to stay in their house for four months. Honey don’t have job, so while in Vallejo, we pick prunce at Suisuin, Honey + Jr. punch the branches of trees, + we all pick the fruits on the ground, they pay us by the box. April 1956, we bought a house in Stockton from Mrs Wyly at 205 West Magnolia St. for $5,000.00 pay her monthly for $36.00 My husband find a job at Veterans hospital, see he commute morning + afternoon from Livermore to Stockton, then Jr. join the Navy too after his schooling in Stockton, so with Norma finish high school in Stockton + go to college. houses in Springtown. 1985. We sell our house in Livermore Dec. 1985 for $104,000.00, after paying 2 loans, agent, cleaning repairing, spraying, the house, + all expenses clear $6,000.00 which divided to all children each one gets a share of $10,000.00. Now I moved to Gloria’s place Sept. 22, 1985 have my own room. go out every Jason’s game to other cities, take a vacation to Hawaii, Ohio, and see other places here in Cal. + we went to Lake Tahoe in every summer. I’m going to Dr. sometimes Not to forget I had an accident last Nov. 26 1985. I’m cooking pancit, because of heat I feel unconcious + place my right hand on top of the stove, degree burns of my hand + fingers, my right thumb was cut off by the nails. I have my income every month, which my dearest husband did for my benefit, I don’t have to worry. I had my life insurance for my funeral the lot is paid since my husband did at his side at Memory Lane in Livermore.